Does Venezuela have a Future? The history of Venezuela as an independent country was not achieved by a bourgeoisie anxious to create an internal market by means of national liberation. In reality it was the result of an alliance between British capitalism, at a time when it was anxious to open up foreign markets, and the agrarian classes produced by the Spanish monarchy. Far from developing a booming capitalism, the history of the first century of Venezuelan independence is that of the decadence of the old mode of production, accentuated by new frontiers and dependence on the British. Finally, in the 1920s, Venezuela entered the sphere of North American imperialism as an oil supplier. At this moment its economy passed into dependence on cycles of demand – expansion of the US car market, world wars, crisis, etc. – and the price of oil with all its speculative derivatives. Generally, peripheral countries, weak in the face of the world market, benefited from state capitalism which served to align the old agrarian classes towards export markets, but also, to create a certain national capital that, subsidized by the export sector and protected by tariffs, developed the domestic market. These were Latin America’s golden years. In 1948 Peron built the first motorway in Argentina, from the capital to the airport; in his turn in 1953 Perez Jimenez built a motorway from the capital to the airport. In 1953, months before the suicide of Getulio Vargas, the first Brazilian motorway was built from Sao Paulo to Campinas, the location of the first airport of the economic capital of the country. It is no accident that these structural developments resembled each other. What commodities were transported by air in the 1950s? In the same way as the railways in Britain brought raw materials to British ships from the interior of the country in the early part of the century, the first South American motorways connected their capitals to the new type of ports in which international finance capital arrived. This model peaked in practically the whole continent in the second half of the fifties when exports stagnated. The definitive shock came with the end of the post-war reconstruction period of the central capitalist countries at the end of the sixties. The importance of oil and the price increase imposed by OPEC in 1973  masked at first the deficiencies of a capitalism that had had a miserable rate of profit of 17%, but the truth is that productivity was already falling … and has not stopped falling since then. The reason: the value created in the oil sector and distributed to the rest of the economy. Therefore the relation between newly employed labour and the value created by it had already gone down by 40% from 1957 to the end of Chavez’s life. It is not a question of governments or ideologies. It is simply the verification of one of the main contributions of Rosa Luxemburg: in the imperialist era there is no possibility of independent national capitalist development in a peripheral country. Unable to produce more value per worker, the Venezuelan state attempts to maintain social cohesion by keeping the masses employed since it doesn’t know what else to do with them. It is the “rentier model” which drives dependence on oil prices to the limit. After the end of the development model of the 50s, the benefits of the rate of exploitation began to fall at an almost constant level. This is what explains the well-known turn towards “neoliberalism” since the devaluation of the bolivar in 1983. Using the recipes of the IMF, Venezuelan capital recovered profitability by the end of the 1990s. Economic stagnation feeds political crisis, fostering a change in political debate and internal reorganisation. In 1999 Chavez came to power. “Chavismo” became famous for its rhetoric and its “social” projects but survives until now for its ability to give Venezuelan national capital a way out. Its struggle against the sectors anchored in the old and unsustainable model, the so-called "Bolivarian revolution", is in its favour precisely because of that. In the hour of truth, during the coup of 2002, the petit bourgeoisie and a significant part of the Venezuelan bourgeoisie, declared themselves for “el Comandante” because they already saw the results of political change. 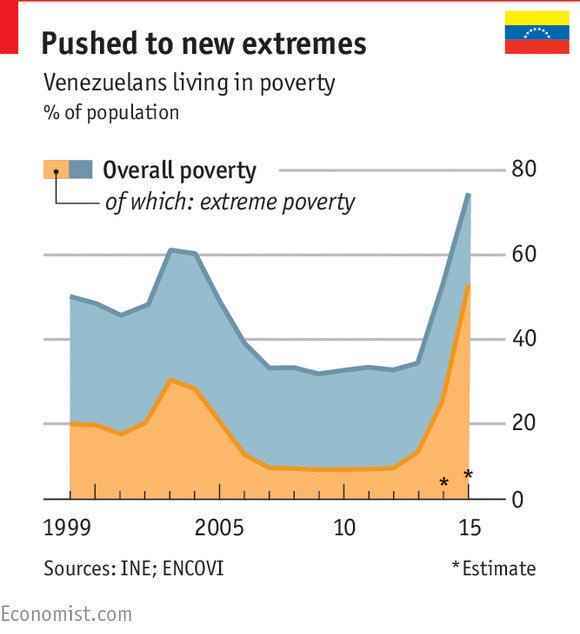 The "change" that consolidated Chavismo was the recovery, for the first time since the 1950s, of the rate of profit, which accompanied the redistribution of income at the expense of labour. From then on, the reorganisation of the state apparatus and above all of the PDVSA, consolidated its own faction in the national capital, a characteristically chavismo “bolibourgeoisie” that would be the support of the regime during all these years. Paradoxically the reorganisation that followed the 2002 coup would have costs for capital by disorganising oil exploitation, and driving away that part of the petty bourgeoisie linked to the technical aspects of production. Chavismo, moved by the very factions of state capitalism that it had strengthened and even created it, redoubled its commitment to the centrality of oil as the only viable engine of the national economy. The non-oil exporting sector became moribund and a social cohesion policy was tried to guarantee a mixture of direct rents to the sectors excluded from a production process that did not know how to absorb them in a productive way amid a growing authoritarianism. But from the point of view of capital, that is, its profitability, the model continued to work with optimal results while oil prices continue to rise. Just 15 months after Chávez's death in June 2014, international oil prices plummeted. The regime could not help but collapse, unable to maintain basic cohesion within the different bourgeois factions and more and more fearing a social revolt. In 2015, Chavismo lost the parliamentary elections. Then began an increasingly violent political battle between the two poles of the Venezuelan bourgeoisie – the Chavez camp and its opposition – that reached its zenith in the summer of 2017. The battle was settled with an official victory and the consolidation of the power of a National Constituent "Assembly" (ANC) representing all the Chavista supporters with dictatorial powers. The strategy of Maduro and the ANC has been focused up to now on saving the state from bankruptcy by increasing its dependence on Russian and Chinese capital. One of its first measures was to modify the "Organic Law on Hydrocarbons" to eliminate the minimum 50% of state participation in mixed projects. This disguised privatization of PDVSA, whose central body is already very undercapitalised, was the basic requirement of Rosneft (an alliance of Russian capital and British Petroleum) to enter the Orinoco basin. Privatization was then extended to all mining, in response to Chinese demands. The Venezuelan ANC of Maduro this summer privatised oil and mining at the demand of Russian and Chinese capital in order to avoid state bankruptcy. What the "crisis of the pernil"  has shown is not only the zero credit available to Venezuelan agencies from abroad, but also the extreme fragility of a large part of the population that lives in despair and whom the armed forces do not know how to contain or to provide with food. This Christmas in Venezuela has been one of shortages: scarcity of food supplies, lack of cash to spend in shops, lack of basic services and even care in hospitals. Social decomposition is already savage. In 2017, Venezuela counted more than 26,000 murders almost 70% of the total casualties for all the Yugoslav wars of the 90s put together. Four of the most violent and dangerous cities in the world are in Venezuela ... do we need to continue? DOES VENEZUELA HAVE ANY FUTURE? Venezuela is the sad demonstration of the impossibility of an independent development of national capital in the imperialist era; the material refutation of all the arguments in favour of "national liberation" in the periphery of the world market and the denial by brute facts of all the progressive illusions in state capitalism that have been sold to us for decades by the leftists as "socialism". Today, capitalism in Venezuela has no other road ahead than social decomposition, massive migrations and the authoritarian development of the state. The perspective of capitalism in Venezuela is that of a new failed state and dependent on this or that imperialism. For Venezuelan workers, the only way is to develop their struggle outside the Chavismo camp, or anti-Chavismo camp or any other bourgeois faction, to act for themselves just as the Kurdish and Iranian workers are doing and learn to become strong through autonomous struggle. Any confrontation that goes on in the name of the nation state, of the country, of Venezuela, even of the "great Latin American homeland" ... is condemned to be defeated again and again. More than any other reason because "the nation", the very impossibility of building an independent nation state in the current period, is the origin of the problem, the opposite of its solution, the barrier to be torn down. In order to fight capitalist decomposition and those who continue to benefit from it, workers must break out of the jail of nationalism. Pig’s feet are a traditional Christmas meal for the Venezuelan people but in 2017 for many proletarians and the poor in general there were no "perniles" this year. Maduro blamed the Portuguese for this lack of "perniles".